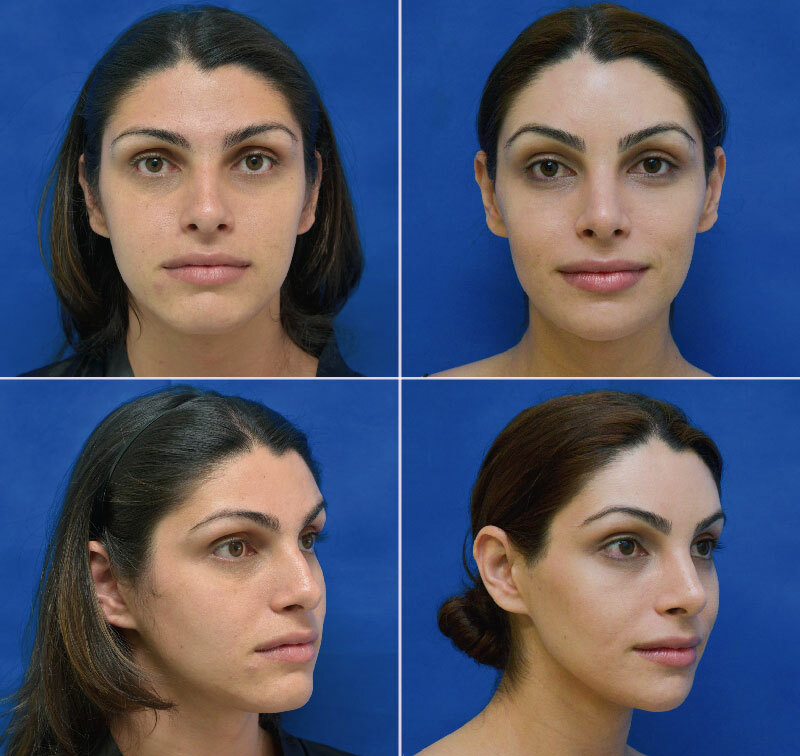 Facial feminization should be approached in facial thirds: the upper third of the face, which involves two areas that are fundamental to the visual identification of facial gender, the forehead and the hairline, the middle and the lower third of the face. To achieve the best possible results, the forehead and the hairline must be treated as a single unit. From this point forward, the forehead region (forehead, nasal root, orbits and supraorbital ridge) must be approached taking the patient’s hairline shape into account. Only in this way can the most suitable treatment be selected according to each patient’s individual needs. This procedure addresses the bone of the entire forehead and eyebrow region, sculpting it to a more feminine and softer profile. The forehead is reshaped through different techniques depending on the area of the frontal region: in the center area, reconstruction is performed removing the frontal sinus plate in 1 piece, reshaping this fragment as well as its cranial base and refixating it with titanium 1.2mm screws. The lateral areas of the forehead (orbital rims) are sculpted with burring. The eyebrows would follow by repositioning them over the newly shaped browbone, for a natural effect. In every case, it should be taken into consideration that the above procedures may be performed via an incision hidden within the hair on the crown of the head (coronal approach) or at the hairline level. In a personal consultation it is possible to discuss the two options in depth to determine the ideal approach for the patient. A hairline approach should be avoided due to the visible scar it may leave, its inability to sufficiently close peaks (which is better treated with hair transplants) and comparatively unnatural results as well as the fact that a feminine forehead is in reality higher than commonly believed, so shortening is not always beneficial. A hairline lowering surgery is suitable for one out of every 20 cases. To complete the hairline correction, it should be considered an immediate hair transplant in conjunction with the forehead reconstruction (about 1,500 – 1,700 units, depending on the size of the donor strip). Hair transplants are the only reliable method able to obtain natural quality results in the hairline, far superior than with any other type of surgical procedure. With immediate transplants, it is possible to take advantage of the strip of scalp removed in the coronal approach, permitting optimal results of the forehead and hairline in a single operation. Alternatively, outpatient microcapillary transplants can be performed before or after FFS. Depending on how the hair follicles are obtained, two different techniques can be used: follicular unit strip surgery (FUSS, also known as follicular unit transplantation or FUT) or follicular unit extraction (FUE). In the FUSS technique the follicles are obtained from a strip of scalp removed in a small surgical procedure, while in the FUE technique the follicles are obtained one by one, without any need for an associated surgical process. This latter technique usually requires more experience given its technical complexity and generally takes longer. 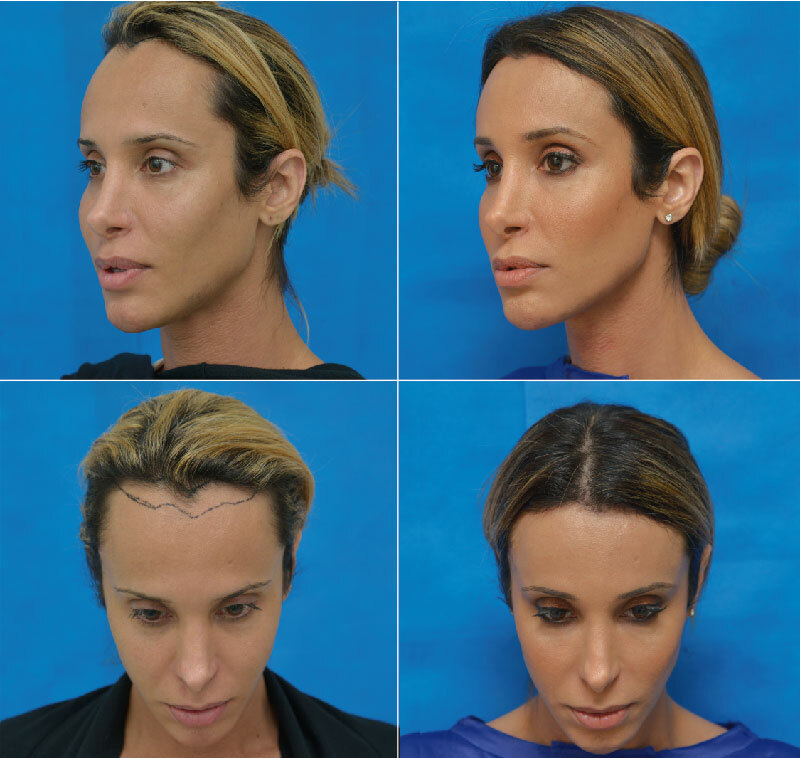 To perform a malar or cheek augmentation pre-formed implants are normally used. It allows the growth of bone tissue inside thanks to its porous structure (e.g. Medpor® Implants are made of porous polyethylene). This growth of internal tissues impedes the implant from moving out of place. 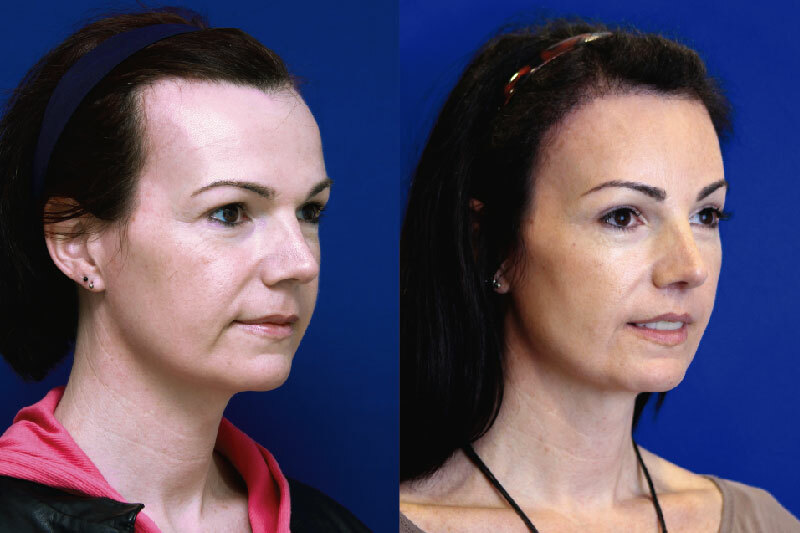 Additionally a malar augmentation is performed using fat transfer, although this technique requires extensive experience on the part of the specialist to obtain and manipulate the graft and meticulously place it in the key areas. Much of the fat may be reabsorbed so the technique typically requires multiple sessions to build permanent volume. The ideal technique is always based on both structure and aesthetics. The main areas of collapse (tip and dorsum) are normally reinforced with cartilage grafts, which avoids undesirable postoperative changes in the mid- and long-term. By removing a small section of the cartilage of the tip we achieve the improvement or -narrowing- of the nasal tip. The excess of bridge composed of bone and cartilage is removed and a nasal file is used to smooth for a more optimal result. Narrowing of the nasal bone. If the bridge is wide, it can be reduced by a nasal bone fracture on each side and posterior approximation of both towards the midline. Removing the base of the alar cartilage can reduce the volume of the nostrils. Generally speaking, the distance between the upper lip and the nose is longer in males than in females. A liplift is proposed for the reduction of the vertical excess of the upper lip. The aim of the liplift is to obtain a partial exposure of the central incisor teeth when the face is relaxed, considered a more feminine trait. Bone sculpture used on the jaw and chin is fundamental to achieve adequate feminization of the lower third of the face. Surgical techniques include burring and osteotomies. Access to the jaw and chin is always via intraoral approaches to prevent visible scars. Additionally, by using ultrasonic technology, it is possible to make very precise cuts into the mineralized tissue (bone) without affecting the surrounding structures, thus avoiding any type of damage to the mucosa, muscles, nerves or blood vessels. Considered on its own, this feature is one of the most prominent hallmarks of male gender and a true source of stigma for a large number of transgender women. The tracheal structure, which plays a key role in basic life processes like breathing and phonation, has a greater volume and is larger (greater in diameter and longer) in males. 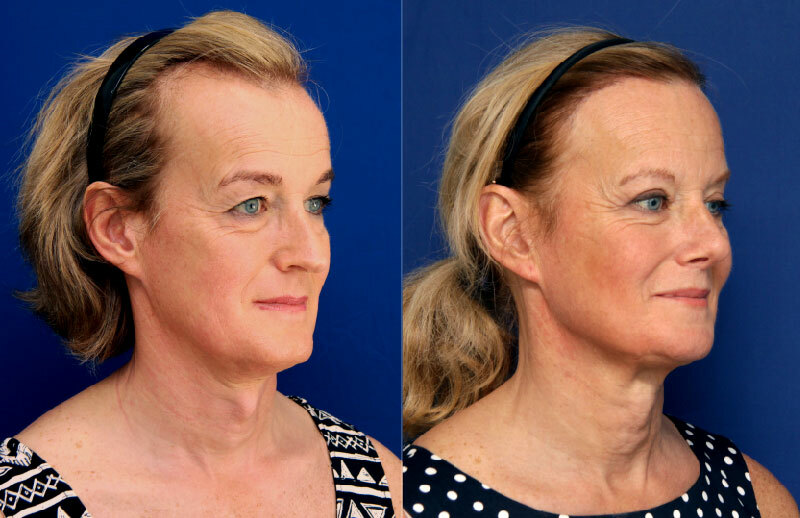 The tracheal structure itself should never be approached with the idea of feminizing it, since this would pose the unacceptable and unnecessary risk of damaging the vocal cords or even causing respiratory problems. Only the most prominent part of the thyroid cartilage should be modified. This allows for a significant reduction in the Adam’s apple without compromising structural integrity.